I can’t believe my accident happened one year ago today – March 12th! Looking back I am feel so blessed to be able to do what I’m doing right now… walk over to the desk, sit in the chair, and type this message. The smallest things seemed like they could be an impossibility 12 short months ago. It has been one heck of a year. Today, I am feeling strong, but very aware of the fact that I still have a long way to go. Physical therapy has moved to a new level. I now feel like I am really working out and getting stronger. I am riding the bike, doing intensive “gate” training, and doing the stair master! I have set goals to run a 5 or 10k and want to hike up to the top of Half Dome again. What is so cool is that I know I will be able to do it! I could not stop and reflect on my one-year anniversary and not think of the people who have gotten me through it. First and foremost, I think of my wife – Kristen – and thank her for her incredible love and support… I am so thankful for you. Additionally, my whole family has been amazing. In fact my brother just called me 30 minuets ago to tell me that he was thinking about me. I thank my dearest friends and my Life Group. Of course, I’ve got to give a shout out to Rock Harbor for supporting and loving on Kristen and I in such tangible ways through our crisis. I am forever impressed and thankful for the church at large… and know that so many people were praying for me when I needed it so desperately. And Lastly, I think of all the professionals who cared for my broken body… the fireman and paramedics who carefully picked me up from the side of the road and took me to the hospital; The ER and Trauma staff who began to mend my body; The nurses and nursing aids who faithfully performed the thankless tasks of bathing me, empting my bedpan, and serving me in my broken state. My favorite Physical Therapist, Rebecca, and Occupational Therapist, Donna, who guided me back to normalcy by helping me get out of the hospital bed, and dress myself, and take my first shower, and take my first steps. I am forever indebted. Thank you God for saving my life, for healing me, but most importantly, thank you for the people you’ve put in my life and the ways you’ve used them to minister to me. About two months ago Mark was given clearance to start putting weight on his right leg, where the femur is healing from a very serious break. Since that time, he’s been going to physical therapy about three times a week to gain his strength back in both legs, and to start learning to walk independently again. He is still using crutches to walk, but he has gained quite a bit more mobility and is able to put about half his body weight on the right leg. He’s also driving again, and has gone back to work, so things are feeling much more “normal” for us since we began this journey. One of the main issues at this point is that Mark is still experiencing quite a bit of pain in his right knee when he tries to walk. His therapists are concerned that there has not been as much progress in the last few weeks as they would have hoped, because his knee cannot support his leg to walk independently of crutches. It has felt like a bit of a roadblock, physically and emotionally. Things seemed to progress so quickly in the hospital, that I think it is hard for us to be patient with this portion of the recovery, especially when it seems to have hit a plateau. He has been referred to a specialist, and will be having an MRI done next week to see if there was some damage sustained to the knee that went unnoticed before. For the time being, he is building up those triceps on the crutches! This week we are off for a much-needed vacation in Hawaii with both our families. Mark is excited about testing out his new hardware in the airport metal detectors. He’s also looking forward to practicing walking without crutches in the pool, which is really good therapy for him. (I’m looking forward to laying in the sun, which is really good therapy for me). Well, not exactly. Mark was given clearance on Thursday to start putting weight on his right leg, where the femur is healing from a very serious break. This was the news we were hoping for. But because his muscles have atrophied over the last two months, he is really only able to put a very small amount of pressure on the leg without having intense pain. Surprisingly, the pain is not from his break, but actually in his knee and ankle joints, and in the ball of his foot from not having been used. So for the time being, he is using his crutches to move his right leg in the motion of walking, without really putting weight on it. Next week, he’ll start the intense physical therapy to help him walk independently again. But for now, as someone said to him yesterday, it’s just good to be “vertical and breathing”. The doctor gave Mark a good prognosis on Thursday. The main concerns at this point are watching how the right leg heals. Right now, his right leg is about a half-inch shorter than the left, due to the injury. His leg is also misaligned, so that his knee and foot angle to the right. The hope is that these issues can improve during physical therapy, but they could pose some long-term problems with walking and back alignment. There have been so many miracles so far, so we’ll keep praying for a full recovery! It’s been about three weeks since Mark was discharged from the hospital. Hard to believe! We’ve adjusted to life at home, and after some trial and error, have got a system down where Mark is pretty self-sufficient. He’s still not able to do laundry or cook for himself, but I guess we can’t expect too many miracles to come out of this. Hee-hee. 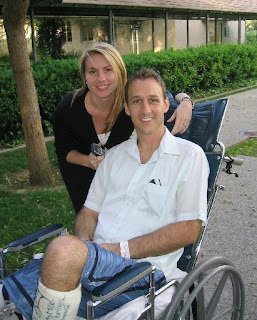 About a week after he left the hospital, Mark had a follow-up with the surgeon who operated on his leg. He allowed Mark to take off the brace that was limiting his movement, which we were thrilled about! The less-than-thrilling news was the x-ray indicated that Mark is still not able to put any weight on his right leg. This doesn’t mean that he isn’t healing – I think the doctor is just being precautionary and would rather wait than have Mark trying to walk before he’s ready. But of course we were bummed, because we thought it would be a bit sooner. Mark has another appointment this coming Thursday, and we’re hoping he’ll get the green light this time. That is our big prayer request for the time being. The last few weeks have really been a waiting and healing period. 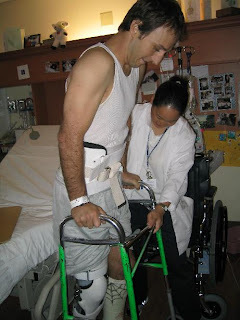 Mark was having physical therapy at our home for a while, but they made as much progress as they could until he’s cleared to use the other leg. He officially “graduated” from home PT last week, when he learned to use crutches. He’s still wobbly, but at least the crutches don’t solicit jokes about putting tennis balls on the bottom the way his walker did. Mark has spent much of the last few weeks in his new garage, which friends remodeled as a surprise for his homecoming. We have been able to go around town a bit, but Mark still struggles with fatigue and nausea if he does too much. So, for the time being, we decided to take a timeshare week that we had to cancel in April, and are spending a couple days in Carlsbad to relax and refuel. There is a pool here, and it has been wonderful for Mark to do his legs exercises in a “weightless” environment. There was an article about Mark in our local news magazine, The Current. You can read it at http://65.54.244.250/cgi-bin/linkrd?_lang=EN&lah=5b19e8e353b8bfc395db0e28fd62c9fe&lat=1083626759&hm___action=http%3a%2f%2fepaper%2eocregister%2ecom%2fDefault%2fClient%2easp%3fenter%3dtrue%26skin%3dOCW%26Daily%3dOCWTheCurrentWest%26GZ%3dT%26AW%3d1083366678578 . It was a little strange to see the details in print, but hopefully it can be a witness to others of the hope God can provide. We’ll head home on Thursday, for Mark’s next follow-up appointment, and hopefully next week he’ll start the physical therapy process to walk again. Thanks for keeping us in your prayers!